NASA’s DEVELOP National Program, part of the Applied Sciences Program, is celebrating its twentieth anniversary this year. What began with three student interns in 1998 has evolved into a national program engaging hundreds of participants and partners each year. Turn to page 11 of the September-October 2018 issue of The Earth Observer to learn more about DEVELOP’s history and its 2018 Earth Science Application Showcase held at NASA Headquarters. The Gravity Recovery and Climate Experiment Follow-On (GRACE-FO) mission launched onboard a SpaceX Falcon 9 rocket, Tuesday, May 22, 2018, at 12:47 PM PDT (3:47 PM EDT) from Space Launch Complex 4E at Vandenberg Air Force Base in California. To learn more about GRACE-FO, see page 4 of the May-June issue of The Earth Observer. 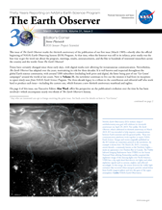 The Earth Observer has entered its thirtieth year as a NASA publication. The very first issue was in March 1989. Our archives are a veritable treasure-trove of history about the development of NASA’s Earth Observing System (EOS), the broader NASA Earth Science Research, Applications, and Flight programs, and related education and outreach activities. In the feature article on page 5 of the March-April 2018 issue, our Executive Editor takes us on a trip through The Earth Observer archives, no doubt stirring memories in readers who were part of these events. For all our readership, we hope that a better appreciation for the past helps inform our present and future endeavors.